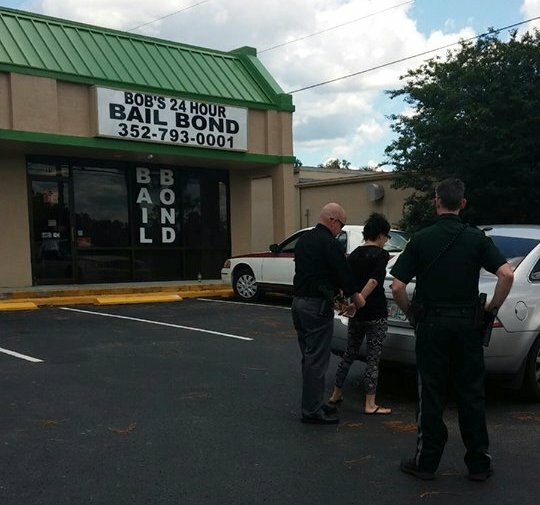 A bail bondsman that usually bonds criminals out of jail, found himself behind bars Thursday. At approximately 1 p.m., Thursday, Citrus County Sheriff’s Office detectives arrested Robert Alexson, 55, of Bushnell. Alexson is the owner of Bob’s 24 Hour Bail Bonds, located off of Hwy 44 in Lecanto. 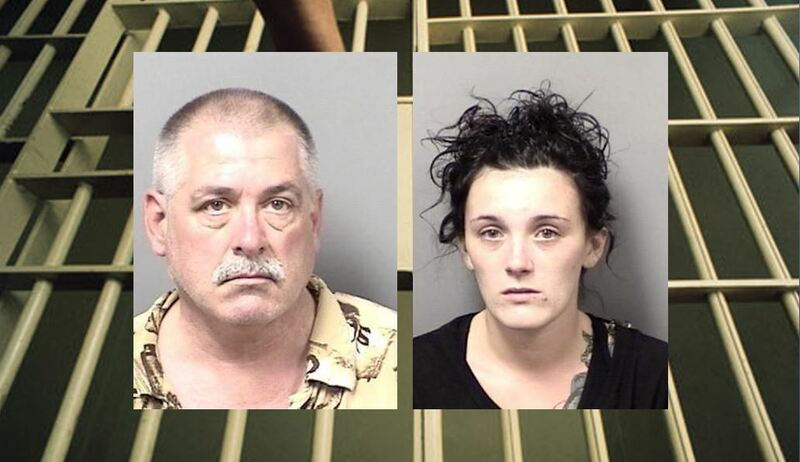 Detectives also arrested his girlfriend, Brandi Jugov, 23, of Dunellon. Jugov was an employee at Bob’s 24 hour Bail Bond, however, she was not a licensed bail bondsman. Detectives said that the couple was arrested after an investigation revealed some very disturbing details in regards to an incident that occurred on May 9. According to reports, Alexson and Jugov met with a man in Inverness, who owed money as the result of being bonded out of jail. According to the victim, he was contacted by Jugov who wanted to meet up with him to “sign some documents.” Jugov met with the victim while he was walking with his girlfriend’s children in front of a residence on Zephyr Street in Inverness. When Jugov arrived, she exited her vehicle and spoke with the victim. A Short time later, Alexson arrived in a white Ford Crown Victoria. Alexson then pulled out his Taser, pointed it at the victim, and handcuffed him. Alexson then placed the victim in the back seat of the Crown Victoria. The victim stated that Alexson told him that he must pay him the money he owed, or he would be arrested. Alexson then drove off with the victim in the car. Jugov also drove off in her own vehicle, and left the two children on the side of the road. A witness watched the entire incident. The witness got the children to safety and called their mother. Jugov then returned to the scene and flashed a badge at the witness. According to the witness, Jugov stated, “I am a bondsman and can’t control what happened to the victim.” Jugov then took the children against the witnesses wishes, and fled the scene for a second time. The girlfriend then arranged to meet at a local gas station in Inverness. When Alexson and the victim arrived, the girlfriend only had $300 and [they] agreed it would be enough to release the victim and the children. Alexson then wrote out a receipt for the $300, gave it to the victim’s girlfriend, and released the victim and the children. Detectives reached out to the Florida Department of Financial Services, which is the regulatory agency that has administrative authority over bondsman in the State of Florida. Detective Dalton with the Citrus County Sheriff’s Office worked with their agents and was able to build a case against the boyfriend Alexson and Jugov. After weeks of collecting evidence, talking with witnesses, and meeting with the State Attorney’s Office, warrants were issued for both suspects. Alexson was charged with: Kidnapping While Armed (Capital felony), Extortion While Armed (1st degree felony), False Imprisonment While Armed (1st degree felony), Child Abuse (3rd degree felony), Unlicensed Bail Bondsman Activity (1st degree misdemeanor), and Unlawful Bondsman Activity (3rd degree felony). Jugov was charged with: Principal to Extortion While Armed (1st degree felony), Principal to Kidnapping While Armed (Capital felony), False Imprisonment While Armed (1st degree felony), Child Abuse (3rd degree felony), Unlicensed Bail Bondsman Activity (3rd degree felony), and Falsely Impersonating a Police Officer (3rd degree felony). Bail bondsman work throughout the entire state. If you have any information regarding illegal activity involving Bob’s 24 Hour Bail Bond, please call Detective Dalton with the Citrus County Sheriff’s Office at 352-726-1121 or e-mail cdalton@sheriffcitrus.org.